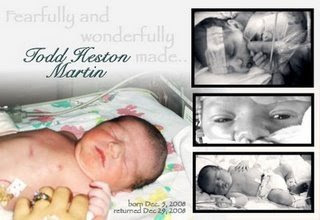 I can hardly believe that two years have passed since we celebrated the life and death of Baby Todd. Everyone who has ever experienced the loss of a loved one will say that those anniversaries get easier with each passing year. While I tend to agree and believe that one day it will get easier; I'm not completely there yet. My heart still hurts a little, and I miss him more than anyone could ever know. We love and miss you Baby Todd...and look forward to the day when we will see you again! losing someone you love is very sad, i'm not sure if i can bear with it.